Pauline Clark spent an afternoon with us in our Roasting Shack last month learning all about what we do here at St. Joseph Island Coffee Roasters. She furiously scratched down notes as we chatted about the virtues of Fair Trade, coffee farmers, green coffee, roasting, and all sorts of various tangents. 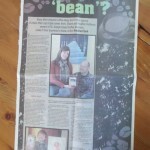 Somehow she went home and organized her thoughts and notes into a two-page feature article about us in the Saturday, February 16, 2013 edition of the Sault Star. If you missed the paper that day, and would like to read the article, click here. 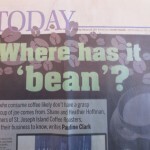 Sault Star `Where has it `bean`? Shane posing with Pauline Clark. Earlier in February, we appeared in the Arts Council of Sault Ste. Marie & District`s ARTiculations. 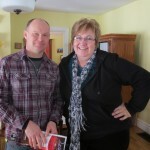 Shane was just interviewed last week by Lindsay Kelly for Northern Ontario Business magazine, and we are apparently mentioned in the current Cottage Life magazine. Shane was interviewed by that magazine last fall. Phew! I just followed a link from Facebook and found myself (literally) on your site! I had a wonderful afternoon with you both and learned so much about coffee. In fact, my recent trip to Puerto Vallarta and San Sebastian had so much more meaning as I came across coffee plants, berries and beans out in the sun to dry. I fully understood exactly what was going on–and I think everyone else on the tour thought I was off my rocker. The tour bus was blowing the horn waiting for me and I was still talking to the coffee roaster! Of course I had to buy some too and even though it’s not bad, St. Joseph Island Coffee Roasters is still my favourite! We enjoyed meeting with you, too. Thanks again for all your hard work writing the article. Sounds like a wonderful trip!